A collection of useful information. Step 1: Download VSCode and install it. git config --global user.name "Bob Dole"
git config --global user.email "user@email.com"
When you log into GitHub, in the upper right corner you will see a + symbol, click that and choose "New Repository"
Launch Git BASH (this was installed as part of Git) and navigate to the local location you want the repository to reside at. Once you log in you now want to open the folder you just cloned the repository to (the way we did it there should be a sub folder called "PowerShell-Scripts" located at the path you were in when you ran the git clone. Click the Explorer tab on the left hand Activity Bar. Browse to the folder you cloned the repository to. 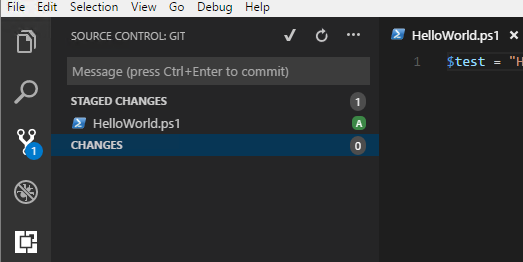 Once the file is open we need to tell VSCode that this is a PowerShell file, if you open a .ps1 file it automatically knows, in the case of a new file we need to tell it, so hit CTRL+SHIFT+P and type "change lang" and hit enter and type "ps" and hit enter, now VSCode knows which Syntax and IntelliSense to use. You will also see that upon doing that it will open a PowerShell terminal pane below your script pane. After you type some example code click File -> Save (or hit CTRL+S) and save your file t the folder your repository exists in. Click on Source Control in the Activity Bar and you shoul dnow see your file there, when you hover over it you should see a + symbol, click that, this stageds your changes you just made. You should see the "U" change to an "A". Click the Check Mark at the top of the pane. It will ask you to enter a commit comment, this should be a succinct description of the changes you are committing, in many cases your first commit comment will be "initial commit". When you view the files on GitHub you can see the commit comment associated with the last commit that included that individual file/folder. Once your commit is complete you need to "Push" your changes up to Git, to do this, on the Source Control pane click the Ellipsis and select "Push", barring any issues the changes will now be pushed up to GitHub available for cloning and syncing with new users or your other development locations. There you go, changes are now secure, feel free to break your incredibly complex Hello World and you will be able to recover the last working version and collaborate with others on long term scripts requiring multiple developers. The PowerShell provider returned results that are not valid from Get-TargetResource. The <keyname> key is not a valid property in the corresponding provider schema file. The results from Get-TargetResource must be in a Hashtable format. The keys in the Hashtable must be the same as the properties in the corresponding provider schema file. But when you think about it, this doesn't make a lot of sense. In every other resource I can think of it makes absolute sense, because the parameters in the schema determine the status of the resource you want to control, not how you control it and how you test for it. It would be like Get-TargetResource for the Registry resource not returning the information about the key, its value, etc. but rather returning that AND returning the entire contents of MSFT_RegistryResource.psm1 which would make literally no sense. We don't care HOW you check or HOW you set, and returning a Get-Script with the contents of Get-Script is...batty...we care about the resource being controlled. Luckily, the statement that "the keys need to match the parameters" can be interpreted to mean you need to match ALL of them, or it can be interpreted to mean "they just need to exist" and in the case of the Script resource Result does exist. And that is what we need to return. They really need to update the TechNet page to say "GetScript needs to return a hash table with at least one key matching a parameter in the schema for the resource". No need to return potentially hundreds of lines of code in some M.C. Escher-like construct containing itself. Just stick to returning information about the resource you are controlling. If your script sets the contents of a file, return the contents of that file. Not the contents of the file AND the script you used to set it AND the script you used to test it. Ever used DSC to set a binary registry value only to find out no matter how many times it sets it, it always thinks the value is incorrect? Which is 82 32 c5 80 d3 32 67 4f 9c ab 5d f8 c2 06 fc d8 in HEX dies because that 06 towards the end gets turned into a 6, even if that were valid hex it wouldn't match the input and thus the Test-DSCResource fails every single time. This assumes you have WinRar installed to the default path, this will also delete the source files after it creates the zip files. After running this script copy the resulting files to the DSC server in the following location: "C:\Program Files\WindowsPowerShell\DscService\Modules"
$modpath = "-path to dsc wave-"
$output = "-path to save wave to-"
So if you are like me you are not really interested in crossing your fingers and hoping your servers are working right. Which is why it is uniquely frustrating that DSC does not have anything resembling a dashboard (not a complaint really, it is early days, but in practical application not knowing something went down is...not really an option unless you like being sloppy). # Set correct build script location. Write-Host "Checking build script availability..."
I wont go any further into this as most of it has already been covered here before, the main gist of this is, my solution to this problem relies on the fact that I use the XML file to provision DSC on these machines. There are a couple modifications I need to make to my DSC config to enable tracking, note the first item are only there so I can override the GUID from the CMDLine if I want. In reality you could just set the ValueData to ([GUID]::NewGUID()).ToString() and be fine. The first bit of code take place before I start my Configuration block, the actual Registry resource is the very last resource in the Configuration block (less chance of false-positives due to an error mid-config). # Find a list of machine names and role guids. # Convert DSC GUID's to latest verGUID. # See if credentials exist in this session. # Make an initial pass, determine configured/incomplete servers. Write-Host "No Pkg server nodes found or no verGUID detected in Pkg config. Skipping." Write-Host "No QA server nodes found or no verGUID detected in QA config. Skipping." Write-Host "No Production server nodes found or no verGUID detected in Production config. Skipping." # Pause for meatbag digestion. # Monitor incomplete servers until all servers return matching verGUID's. End of the day is this a perfect solution? No. Bear in mind I just slapped this together to fill a void, things could be objectified, cleaned up, probably streamlined, but honestly a powershell script is not a good dashboard. I would also rather the servers themselves flag their progress in a centralized location rather than being pinged by a script. But that is really something best implemented by the PowerShell devs, as anything 3rd party would, IMO, be rather ugly. So if all we have right now is ugly, I'll take ugly and fast. As always, use at your own risk, I cannot imagine how you could eat a server with this script but don't go using it as some definitive health-metric. Just use it as a way to get a rough idea of the health of your latest configuration push. Ever tried to run an App-V 5 app as another user, say your elevated account, and got a whole lot of nothing? Maybe at most you got a 1530 event log entry in Applications? Hit start, type powershell, right click on "PowerShell" and select "Run As Different User", enter the credentials of the account you are trying to use. This will sync that user accounts App-V package store and you should now be able to Run As... to your hearts content. In my case I was syncing files and for the life of me could not get it to see the newest addition to the directory, I could delete older files/folders and it would replace them, but it patently refused to ever copy out the new one. Deleted these files, let DSC run, I could delete the new file/folder to my hearts content and it would always put it back down next time DSC passed. Write-Host "This is a test, and can be removed later." Be warned that this should ONLY be done if you are having the problem accross the board, otherwise just invoke-command on the individual servers or, if only a portion are having problems just feed in an array. In my case EVERY server was failing on this File operation so killing it accross the board made sense. But it is still not something I would take lightly (batch deleting files never is). Looks like killing the WMI provider wont be neccesary much longer, based on this blog post. I figured I would give a more practical and slightly more complex example config, which you can find here. Anything in <> was stripped for security sake but the overall gist of it is there, zAppvImport is a custom DSC resource I wrote to ensure the contents of a path are imported onto a XenApp server, there are a couple weird things I had to account for in this build, namely the legacy apps and the permissions I need to set. These installer for one no longer exists so a file copy is the only way and the other one has a terrible old installer than hangs half the time so it gets the same treatment (it HATES Windows Installer for some reason which seams to corrupt the files no matter what so a file copy it is). This is just an example of a custom App-V XenApp 6.5 server config (that isn't done) that goes from barebones to configured in these few, relatively simple, steps. Install the App-V 5.0 SP2 client. If that sounds simple to you, then you haven't tried it in DSC. If fairness it isn't THAT complex, but it isn't very straight forward either, and there is little real reason for it to be complicated beyond a simple lack of foresight on the part of the DSC engine. The first three tasks are very simple, a Package resource, a Registry resource, and a Script resource. But that last bit is tricky, and that is because it needs the modules installed in step 1 in order to work, but given that the DSC engine loads the ENTIRE script (which is normal for powershell, but given the nature of what the DSC engine does this is, IMO, a BIG hinderance) they aren't there when it first processes, so it pukes. You can tell this is your problem if you see a "Failed to delete current configuration." error (the config btw should at that point be visible right where WebDownloadManager left is, C:\Windows\Temp\<seriesofdigits>) as well as a complaint that the module at whatever location could not be imported because it does not exist. $modPath = "C:\Program Files\Microsoft Application Virtualization\Client\AppvClient"
Create a scripts directory. Not terribly important, you could just bake your script into this path. Find this hosts role/guid from an XML file stored on the network. Copy modules from DSC Module share. This overlaps with the DSC config but the DSC config will run intermittently, not just once, for consistency. Shell out a start to the Consistency Engine. This last bit is VERY important in two regards. The first is that if you just run powershell.exe with that command it WILL exit your script. The only way I've found to prevent this is to shell out so that it closes the shell, not your script. StartInfo.UseShellExecute is thus very important. The second important bit is wiping out the WMI provider, without this it waited three minutes and ran again and promptly behaved like the $bypass was still being tripped, even though I could verify the module WAS in fact in place, I do not like this caching at all. So the first time I run consistency I know it wont put everything in place, because it needs the client installed before the client modules exist and even with DependsOn=[Package]Install it still pukes, depends on doesn't seem to have any impact on how it loads in the resources. Is the LCM still running. So I would probably watch event viewer and the client module folder before making my second run, timing out after ten minutes or so (in this case 15 minutes later the scheduled task will run it again anyway, don't want to get in the way). Why bother with this? Mainly because I don't want to wait half an hour for my server to be functional. I run them initially back to back because I can either bake the GUID in, or use a script to "provision" that, while I'm there why rely on the scheduled task? This is on a Server 2008 R2 server so I can't use the Get-ScheduledTask cmdlet, and while yes I could bake in the Consistency task with a shorter trigger and change it in my DSC config...but that is just as much work and more moving parts. I want to configure and make my initial pass as quickly as is safe to do so, and then allow it to poll for consistency thereafter. The final piece of the puzzle here is configuring a client to actually pull it's config from the server you created. The thing I will note about the GUID you use is, what guid you use depends on how you intend to set up DSC. There are many ways to skin this cat, you can use one GUID per role, say XenApp = 6311dc98-2c2a-4fbe-a8bc-e662da33148e and App-V = 6b5dac21-6181-400f-8c7a-0dd4bfd0926d, this allows you to keep the GUID count/management low, but also makes it difficult to target specific nodes (though how important that is, I leave up to you, for me, I want all my App-V servers to look alike and the same for my XenApp Servers). And then keep track of them in a database. Managing this is going to require more legwork though is you provision servers. Ultimately, for now, I am using the one GUID per role method. This is a slightly modified version of the script example MS posted ot the Gallery, this one a) works and b) installs EVERYTHING you need to build a DSC Pull server, not just hope it's there. The custom resource: Can be found here. The script: Can be found here. I would advise extracting the files to C:\Windows\System32\WindowsPowershell\v1.0\Modules and making sure you right click->Properties->Unblock the .ps1 files. xDSCWebService.psm1 cannot be loaded because you opted not to run this software now. Importing module MSFT_xDSCWebService failed with error - File C:\Program Files\WindowsPowerShell\Modules\xPSDesiredStateConfiguration_1.1\xPSDesiredStateConfiguration_1.1\xPSDesiredStateConfiguration\DscResources\MSFT_xDSCWebService\MSFT_xDSCWebService.psm1 cannot be loaded because you opted not to run this software now. At this point I would ignore MS and just always put your modules there. 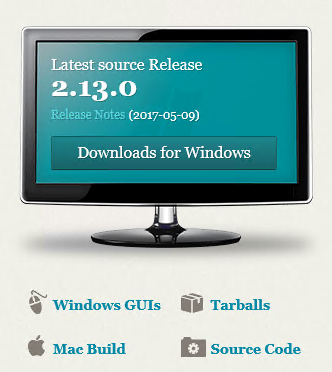 Why does my config seem to use an old resource version? Why is WmiPrvSE using up SO much memory? This kills the WMI provider for DSC and forces it to launch a new one. As to why, well in the first instance I imagine the engine caches the script, and I bet there is a timeout before it will pick it up again. In the second case...it's WMI, either your script or the machine or just the alignment of the planets made it all emo, kill it and move on. Import-Module "C:\Program Files\Microsoft Application Virtualization\Client\AppvClient"
The folder, and this is important, the FOLDER the .ps1d is in should be provided to Import-Module, it will do the rest, don't try to point it right at the .ps1d or anything else for that matter. Why does it do this? I don't know, I suspect it is because WMF 4.0 is rather tacked on by now when it comes to Server 2008 R2, frankly if this is the price I have to pay for being able to use this on XenApp 6.5 servers, so be it! IMO the DSC information out there right now is kind of all over the place, and worse some of it is outdated, so I'm going to collect a few guides here, starting a bit out of order with a guide on how to write your own custom DSC resource. Later I'll put one together for configuring a DSC Pull server and then one on how to configure a client for DSC Pull operations. We wont be using any of the other functionality of it, but it at the very least is handy for creating the initial structure. Extract it like it says but most likely depending on your setup you are going to need to teomporarily run with an Unrestricted ExecutionPolicy. I couldn't unflag it to save my life and frankly didn't spend much time on it, remember to set your policy back after using it and there are no worries. What is essentially going on here is we are setting up our variables and then building the folder structure and MOF for our custom resource. Saving it all to our PSModules path so once you run this command you should be able to Get-DscResource and see zTest at the bottom of the list. That is pretty messy and all one line but you get the idea, there is no logic built in, you need to provide all the logic. Whether that be ensuring that you don't just assume that because the file exists it must have the right contents, or the logic to ensure that if $Ensure is set to "Absent" that you are removing the file thoroughly, handling errors, not outputting to host, etc. etc. Again, this is quick and dirty and not meant to represent the most robust function possible for creating/populating a file or deleting it thoroughly. Liberal use of try/catch and thinking about ways it could go wrong (including doing a little of your own validation to make sure what you just did took hold) are recommended. For now I'm not going to go too far into this, I'll just say that in reality this appears to be an informational function that allows you to pull information about the asset in question without actually doing anything. It MUST return a hastable of information about the object (usually the same information, sans Ensure, that you provide to the script). i.e. Again how strictly this is enforced and how much is really needed...in this example I would almost say not at all. You could just as easily replace $Path with (Test-Path -Path $Path) and drop Ensure entirely I think. I haven't tested the boundaries of how strictly you have to adhere to input->outputin this case. Content = "Hello (automated) World!" Please note that the OutputPath argument isn't required, without it the script will just spit out a mof in, well in this case it will create a folder called Test in whatever folder you are currently in and put it in there. I like to specify it so I know where my mof's are. Once you call it with that final command you should see LCM spit out a bunch of information regarding the process and any errors will show up there as well as in the Event Viewer. Please note that a well written DSC Resource should be able to be run a million times and only touch something if it isn't in compliance. Meaning that if the script doesn't detect the file is missing or the contents are different from what they should be, it should effectively do nothing at all. It shouldn't set it anyway just to be sure, it shouldn't assume, it shouldn't cut corners, or hope and pray. The entire point here is to ensure consistent state accross an environment. The better your script is, the more reliable, and resilient, forward thinking and robust, the better your resource will be. In the case of this Resource, if I planned on taking it farther I would probably make sure I had rights to the file before messing with it, include a try/catch around file creation and content placement, I would check the file existed once more with a fresh piece of memory (if you end up setting the content to a variable) and validate the contents afterwards as well. You could build in the option to allow forcing a specific encoding type to convert between UTF-32 and UTF-8 or ASCII if you wanted, provide options for Base64 input encoding (in case you wanted to handle script strings for instance, or you could make sure to escape and trim as needed) etc. etc. The point being, it is easy to write something quick that will rather blindly carry out an action. But in the long run you need something that is going to be feature rich and robust to match. And don't forget, if you don't copy the folder structure to the client machines, they wont have access to your Resource. The path we created this in on our workstation is the same path it needs to live on every other machine, and once it does, they too will be able to use the Resource. App-V 5: Collect icons for XenApp 6 publishing. Quick script you can run on a machine that will look at any app-v app cached on that machine and collect the icon file for it and spit it out into a structured directory. Click here for the script. The specific path should be fairly obvious if you browse to the printer server hosting the printer in question, it should show up as a device and you can just concatenate that onto the end and pipe it to WMI, simple.